Romitaman Original Comic Book Art :: Private Collection :: Spider-Man / Mysterio Proposed Cover (1980s) SOLD SOLD SOLD! by artist John Romita Sr. Check out this very nice Pinup, which was drawn by the great John Romita Sr in the 1980's for a proposed cover design! 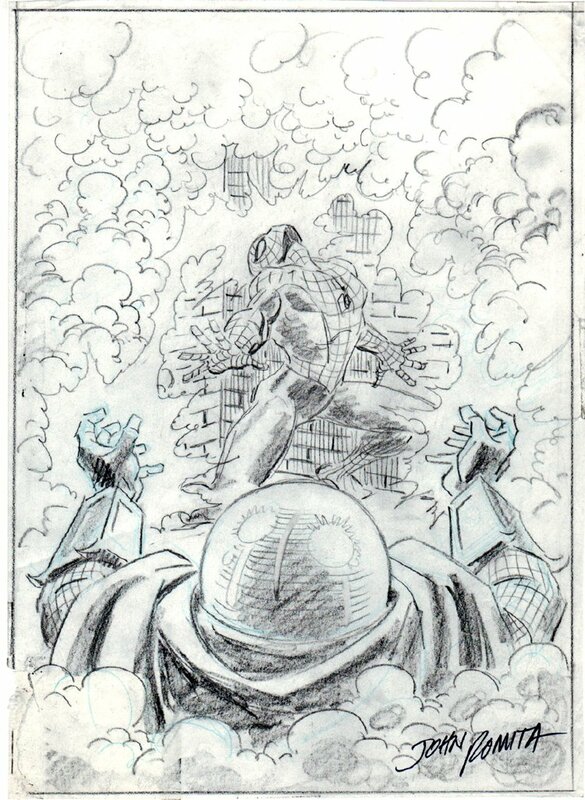 I'm not sure if this image was ever published or not, but its a GREAT FINISHED image, which was laid out first in blue pencil, and then finished in gray pencil, with great pencil shading that John Romita is so well known for. Art features a nice large image of MYSTERIO using ray blasts from his hands to zap Spider-Man! The background MYSTERIO effects, with smoke and all look great as well. Drawn art image measures 8.5 by 11.75 inches on vellum, and it is signed at the bottom! There are 2 small tears in bottom left with a tiny piece missing which doesn't affect the overall art piece. Just a neat piece by this Marvel artist ICON! ALL art on our website (including this one) are able to be purchased with VERY fair time payments, and trades are always considered towards "ANY" art on our website! Just send us an email to mikeburkey@aol.com and we can try to work something out.